Earlier this week the world lost a true warrior when cancer claimed the life of Russell Means, a prominent Indian activist who fought hard for aboriginal dignity and greater freedom in general. Back in September 2004, Frontier hosted him for a series of speaking events and media appearances in Winnipeg. We described him back then as “America’s Most Famous Indian”. He definitely was one of our more thought provoking speakers which will become obvious to anyone who goes back into the vast Frontier Centre web archive to recount the events and dialogue we had with this physically and intellectually imposing man. Here are some recommended audio and video to give you a taste of Russell Means, easily one of the more iconoclastic guests of the Frontier Centre. The video of his speech can be seen here. His interview on NCI, a Manitoba radio network that serves First Nations communities is especially powerful, click here. There are several more items which can be found by googling Russell Means on the Frontier website. 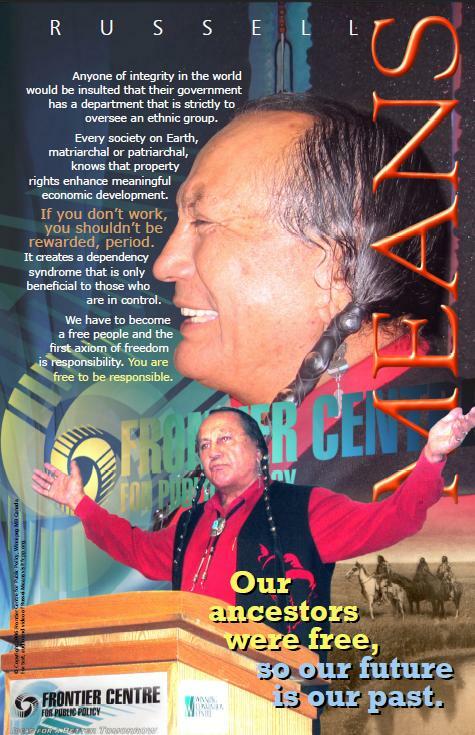 Frontier still has a few copies of a poster we produced featuring Russell Means (see above). Just drop us a line and we will be happy to mail you a copy.